This is not a real manufacturer mark, it merely represents a distributor (trade)mark. Two main versions of this mark are known, for obvious reasons (as can be seen in the mark section below) dubbed 'GC Japan' and 'GC Bavaria'. 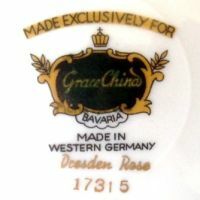 Most 'GC Japan' marked items are from the 'Corsage' or 'Rochelle' series while 'GC Bavaria' marked goods cover the series Dresden Rose, Lady Diana or Romance. Until now I have not been able to find out which original marks were covered up with a 'GC Japan' transfer. On the 'GC Bavaria' marked items, the ⇒cover-up mark used to obscure the original marking hides a manufacturer mark used by one specific subsidiary of the Winterling Group, namely the Winterling factory in the town of (Windisch-)Eschenbach. Note that the mark version covered up was only used between 1950 and 1960; that dating is additionally confirmed by the fact that the cover-up transfers read 'MADE IN WESTERN GERMANY'. 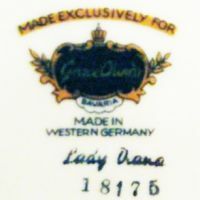 Therefore the series name Lady Diana can not refer to Lady Diana Spencer (as some people incorrectly claim) as items produced during the 1980s-1990s were marked 'MADE IN W.-GERMANY'. 'GC Bavaria', 'MADE IN WESTERN GERMANY', here on 'LADY DIANA'. 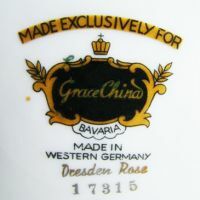 'GC Bavaria', 'MADE IN WESTERN GERMANY', here on 'DRESDEN ROSE'. 'GC Japan'. 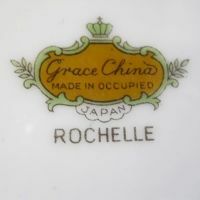 As it says 'MADE IN OCCUPIED JAPAN' these items would be dated between 1945 and 1952.